Say Kids, what time is it? It's Howdy Doody Time! Take your seat in the Peanut Gallery and join Buffalo Bob Smith in song and fun. This radio program was aired concurrently with Howdy's television show of the same name. Enjoy Flubadub talking about meatballs, Clarabell honking his horns, as well as appearances by Dilly Dally, Captain Windy Scuttlebutt, and Inspector John J. Fadoozle. So slip on your cowboy boots, place that smart looking beanie on your head, give it a twirl and get ready to listen to your favorite marionette! For other great children's programs see the collections of Smilin' Ed's Buster Brown Gang, Children's Collection , Let's Pretend, Cinnamon Bear, Wormwood Forest, and Minnesota School of the Air. Love these programs. Great that you have them. I haven’t heard them since I was a kid. It occurred to me a l that the target audience for these recordings is getting smaller. I imagine I'm in the minority as a customer, being under 30. Still, I really appreciate the service your site offers. I haven't been able to find any other site that offers so many recordings. I'll definitely be getting more when money permits it. Howdy Doody was actually more complicated. Bob Smith was the early morning DJ on WNBC in New York, when he was offered an additional Saturday morning slot hosting a game show for children. The show was called \"Triple-B ranch,\" standing for \"Big Brother Bob.\" Unfortunately no recordings of the show are known to exist. Smith created a country-bumpkin character called Elmer, who would appear for a brief routine of hayseed humor. 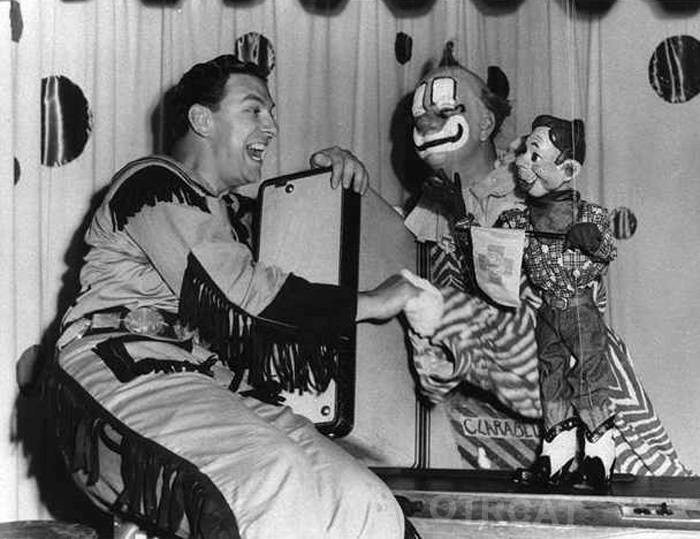 Elmer would greet Smith with \"Well Howdy Doody!\" Kids coming to the show to participate in the games, or just be in the audience, were disappointed when Smith just spoke in a different voice as Elmer (this was radio, after all). They wanted to _see_ \"Howdy Doody.\" So Smith stopped calling the character Elmer and called him Howdy Doody, since that was what the kids were calling him. And if the kids wanted to see Howdy Doody, he talked to the TV people about a puppet show. He went to the TV people on a Tuesday, and they said, \"You\'re on Saturday.\" This was too soon to make a puppet, so while other puppets appeared, Howdy Doody was hiding in a desk drawer, too shy to come out, for the first two shows. So Howdy Doody started as part of a local radio show. 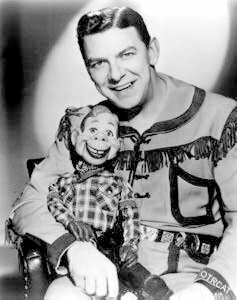 Then a few years later, a Saturday morning Howdy Doody radio show was done on NBC, I think starting in 1951. It ran until September 1954, when Smith had a heart attack. The TV show continued until September 1960.